I receive very often emails with questions about car parking in Korcula Old Town or in its surroundings. There are questions like ‘Is it possible to park in Korcula Old Town?” or ” Do we have to pay for our parking in Korcula?” so I am going to write a bit about that. First of all, Korcula Old Town is located on a small peninsula. There are two main entrances to the Old Town and both are entrances via steps. Furthermore, all streets ( except one – Kala Dei Pensieri ( Reflection Street ) – hence the name) are very narrow and are made of steps, due to Korcula Old Town geographical position which is on tiny (and hilly) peninsula, so I would say it would be impossible to drive through the Old Town even if it’s permitted. Narrow streets are created at the time because the space in the Old Town was (and still is) very scarce. The rest of Korcula Town is built much later, so streets are wider and traffic is permitted. 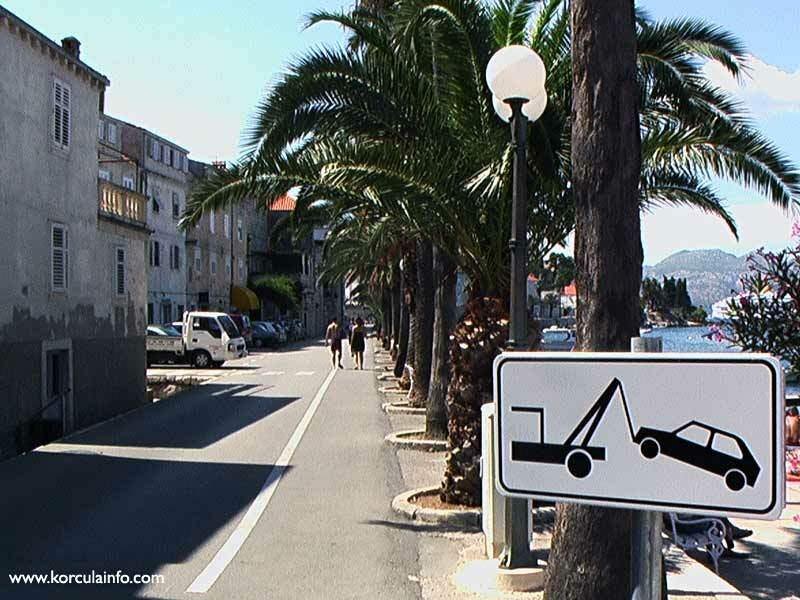 One can park on the East and West pier of Korcula Town, as well as along some streets where parking is permitted. Most of the parking places are controlled by local authority, and parking is charged on an hourly and daily basis. I would recommend everybody NOT to come in Korcula by car, especially in the summer when parking, as well as traffic, can be a nightmare. There are a lot of ferry, catamaran or bus connections to Korcula from Split, as well as Dubrovnik and Orebic, and travelling and arriving by them is much more pleasant and enjoyable way. Once in Korcula, if you need car or scooter for a day or two to drive around the island, you can always rent one with local rental agencies or instead go completely green and rent a bicycle and explore the island that way. There is also a fairly good local taxi boat and taxi car service that one can use for ad-hoc needs. 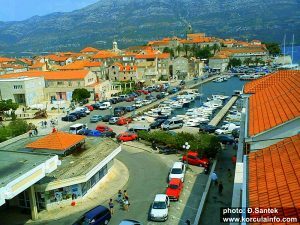 Personally, I never drive a car on Korcula and instead, always use either bicycle, boat or local bus (public) transport. It is cheaper, greener, friendlier and very often faster way to get and travel around. 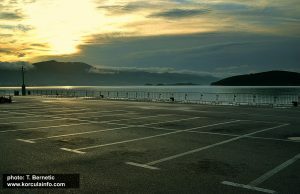 Surely, you don’t want to spend most of your day in Korcula looking for a parking place?! Map of Traffic and Parking around Korcula Old Town is part of the initial documentation of application for Korcula Old Town to be added to the UNESCO World Heritage List. 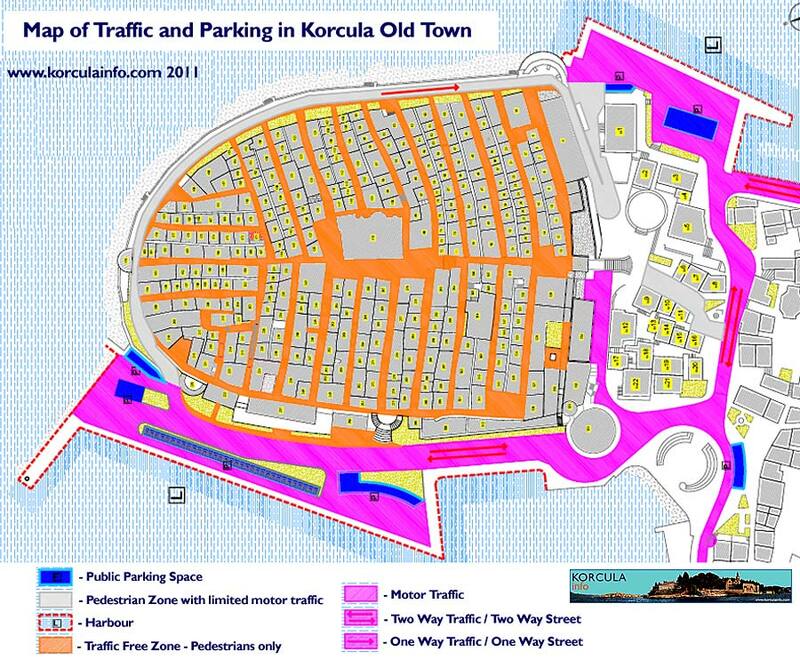 As far as traffic and parking around Korcula are concerned, this map represents the current situation quite well and I thought sharing this map will be valuable information for visitors to Korcula Town. Therefore, I decided to slightly modify the original map to adjust it to English speaking visitors to Korcula and upload it here for all of you to share and use.